Repayment mortgages explained - Which? A repayment mortgage is a home loan where you repay a bit of the capital, which is the amount you borrowed, along with some interest each month. With a repayment mortgage, as long as you meet all your monthly payments you're guaranteed to have repaid your entire loan by the end of the mortgage term, which is usually around 25 years. How do repayment mortgages work? In the first few years of your mortgage term, a bigger proportion of each monthly payment goes towards the interest, and a smaller part towards the capital. With time, the balance shifts, with less going towards interest and more towards paying off your loan. This can make your first few years’-worth of mortgage statements depressing reading, as you won’t feel like you’re making much of a dent in your debt. But don't lose heart: over time the balance will shift, with each payment clearing more of your loan until the end of the term, when you'll be mortgage-free. You’ll also be able to access deals with lower interest rates as you build up more equity (i.e. pay off more of the loan). Our mortgage repayment calculator can help you work out how much you could pay every month based on loan size, interest rate, fees and mortgage term. While online mortgage calculators are good for getting a rough idea, you'll get a much more accurate view by talking to an independent mortgage broker such as Which? Mortgage Advisers. Our team can check how much you could borrow based on your personal circumstances and recommend the best deal for you. Call them on 0800 197 8461 or request a callback. You can find out more in each of the detailed guides linked to above, or for an overview of each type, visit our guide, mortgage types explained. Repayment mortgages vs interest-only mortgages: what's the difference? Unlike repayment mortgages, with an interest-only mortgage you just pay interest to your lender each month. 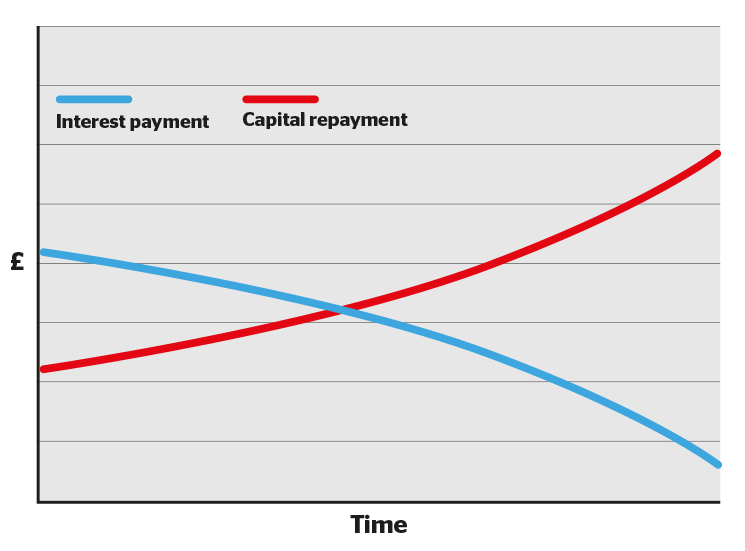 You don't pay off any of the capital that you've borrowed until the end of the mortgage term, at which point you have to pay the entire amount back in one go. Interest-only mortgages are usually only available on buy-to-let properties. If you want to take out an interest-only mortgage, you’ll need to make other arrangements for paying back the capital. Mortgage lenders describe this as setting up a separate 'repayment vehicle', which might mean paying a monthly amount into an investment, such as a stocks and shares Isa. Taking out an interest-only mortgage is risky, as there is no guarantee that the money you’ve invested elsewhere will be enough to fully pay off the mortgage when the term ends. You’ll also pay more in total for an interest-only mortgage as you’re paying interest on the entire loan every month, whereas with a repayment mortgage the amount of interest you pay reduces as you clear more of the loan. Just the interest charged by your lender. The interest charged by your lender plus part of the mortgage loan itself. How much will I owe at the end of the mortgage term? The full amount originally loaned to you by your mortgage provider. Nothing, as long as you have kept up with your monthly repayments. What is the monthly interest calculated on? The full amount loaned to you by your mortgage provider. The amount you still owe on your mortgage, which will gradually decrease. The biggest risk is not having enough money to pay back the loan at the end of the term. If you don't meet your monthly interest payments, your property may be repossessed. If you don't keep up your monthly mortgage payments, your home may be repossessed. You are free to invest the money you would have spent on monthly capital repayments elsewhere until the end of the term, meaning you could potentially make a profit. However, as you'll be paying interest on the full loan for the duration of the mortgage, you'll pay more in total than you would with a repayment mortgage. Generally speaking, the greater your equity (the portion of the property that you own outright), the better mortgage rates you'll be able to access when switching mortgages. As your equity grows with each monthly payment, you'll be in a stronger position when the time comes to switch.